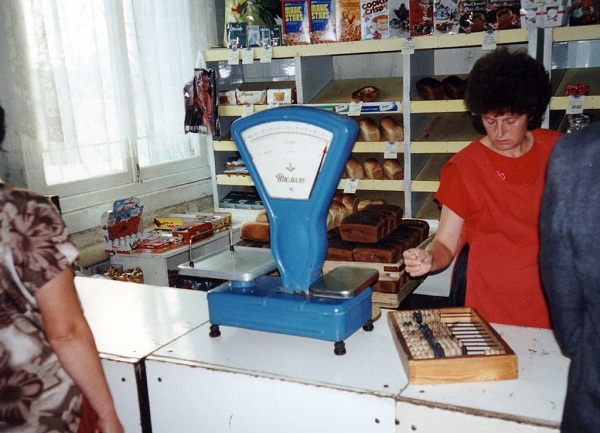 Grocery shopping in today’s Russia is uncomplicated: The Soviet scarcity of everyday products is in the past, and nobody remembers those huge lines for sugar or shoes anymore. Nowadays, the food shortages are gone, there are plenty of different shops everywhere, and their opening-times are often very generous. It’s possible to find stores that are open 24/7, and almost all shops are open on Sundays. Thus, the key question has changed from “Where do I get food?” (“Где доста´ть еду´?“) to “How not to get lost in all this variety of shops?” Let’s review some of the kinds of shops. Кио´ск. Kiosks are small, ubiquitous stalls, and will provide you with emergency supplies anytime: Cigarettes, drinks and snacks, like chocolate bars, can be bought in any average kiosk next to a subway station or to a bus stop. Some kiosks are specialized in Russian fast food: Look for the signs “Блины´” (bliny, pancakes), “Пирожки´” (patty-cakes) or “Карто´шка” (potatoes – baked or fried). Магази´н. In a Russian-style grocery store, you can’t select items from the shelves yourself. Check the products and prices on a display or ask for them, make your choice, and tell the vendor to give you this or that. You then pay the vendor, or go pay at the cashier’s desk, then bring your receipt back to the vendor, and only then get your stuff. Sounds like a hard job, so it might be easier to look for a nearby supermarket. Суперма´ркет. A Russian supermarket is just like a Western one, no surprises here except for serious-looking guards at the entrance who might want to check the contents of your bags. Sometimes, you’ll even have to leave your bigger bags in a locker outside. The markets range from cheap to luxurious – some examples can be found in our links section. Organic foods are not as popular in Russia as in the West, and cheaper foods are rumored to be made of industrial by-products, so the biggest bargain is sometimes not the best of choices.